Did you grow up with the Frog Prince or the Frog Princess? Not only I (and my whole generation, I think) grew up with the female version of this character but I don’t think I heard about the existence of the other one until I was in my late twenties. It’s especially surprising because we had other Brothers Grimm’s tales translated and published. It might be that the local version – The Princess Frog (or Tsarevna Frog) was one of the popular and loved folk tales: there were books, movies, animated films and predecessors of the modern audio-books – vinyl records. 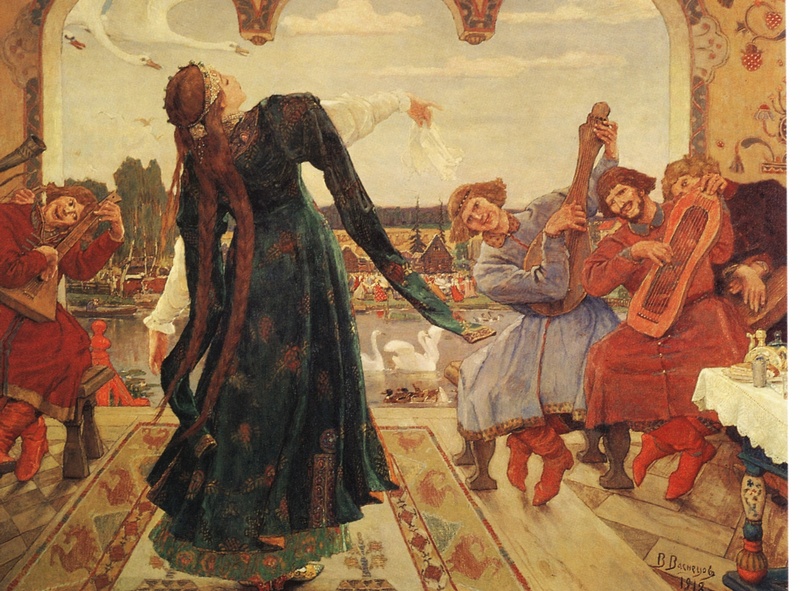 There even was a painting by the famous Russian neo-romanticism artist Viktor Vasnetsov. Just in case anybody is curious, you can read The Frog Princess in English. For the rest I want to mention that, interestingly, there were no kisses involved as well even though, as you can see, the heroine of this tale is older than characters of Grimm’s version. But our folklore also had that kissing frog theme played out in many ways. Lipstick Queen is one of my favorite brands: I love their quirky names and colors (I previously posted about Hello Sailor and Black Lace Rabbit), and I’m constantly on the look-out for their new products. So when last year I saw their Frog Prince lipstick (since then they’ve launched two more product in that line), I had to have it! 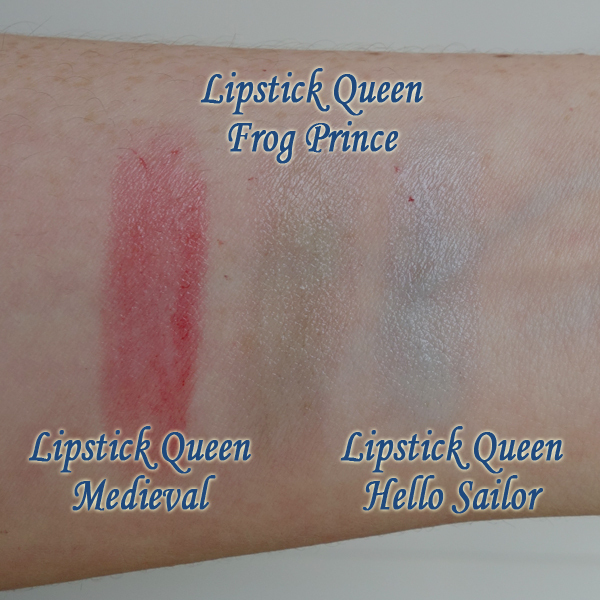 While I liked the idea of a green lipstick, and from my experience with the lipsticks mentioned above I knew that on lips they do not stay blue or black, I wasn’t sure what color I’ll get from that green beauty, so when I saw the holiday set of mini-lipsticks, one of which was Frog Prince, I leaped. The first thought that went through my mind when I looked at the swatch was that mini-size was a good decision: with my pale complexion green lips would look rather unhealthy. But since it was in my hands I had to try it. The transformation was amazing! On my lips it became pink – sheer but with enough pigment. That frog clearly needed a kiss to reveal its true self. I can see more princes in my future. And since I can’t show you the results of that transformation, at least I’ll leave you with the picture of Rusty trying to paw that frog. This entry was posted in "Four legs good", Magic Mirror and tagged Frog Prince, Hello Sailor lipstick, Lipstick Queen, Princess Frog. Bookmark the permalink. 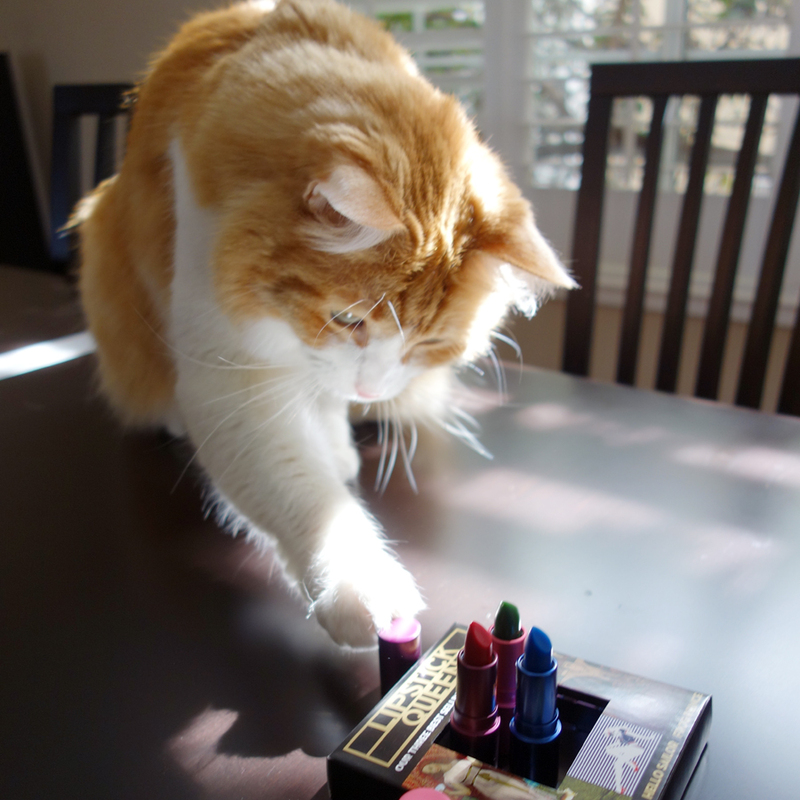 Well, well, it just goes to show you can never judge a book by its cover – or a lipstick by its bullet. I don’t think I would have been brave enough to have got as far as buying a green lippy, though I was given a tiny pottery Frog Prince for Christmas as it happens. Or maybe it was a Frog King? I didn’t know about the Frog Princess, but I am glad to see equality in fairy stories. The lipstick has been tempting me for a while, so I think I will have to buy it. Interestingly I used to have something similar in the late 70s (I think), so it proves that there is nothing new ….. If you kissed Rusty’s fur, what colour would it become I wonder? I wanted to say first that Rusty always stays the same color but then I realized that he actually gets more or less orange-y from time to time but I don’t know to what to attribute these transformations. All sheer lipsticks from this brand that I’ve tried so far were of the type that I can’t imagine would look bad on anybody: they might not be “dramatic” enough for some wearers but, in general, they just give an additional hue to your natural lip color. Here in Canada I was aware only of the prince and the kiss was necessary to represent both risk and trust. I agree with Jillie about nothing new. There was and still is an inexpensive product like this on the market. Acts just like a mood ring, also a feature of the early 70s. I remember color changing lipsticks in my early 20s, and I came across something like that recently as well. The difference is that I like “the whole package.” The first time I looked at that brand was because I liked the name “Hello Sailor” and was intrigued by the blue color. But then I also liked both how the lipstick looked and how it felt on my lips. That is a gorgeous picture of Rusty, Undina. I enjoyed reading the Frog Princess story (had never heard of it before) and seeing that scary-looking green lipstick that turns such a delicate shade of pink. I think you might be on your way to having a very unique lipstick collection. Have you ever tried the somewhat famous Tangee lipstick? It is a clear lipstick that supposedly transforms to become the perfect shade to complement the wearer’s complexion. I have a feeling it’s probably the same shade on everyone, but still it would be fun to try it. He really enjoyed those small tubes. I’m already eyeing two more of their strange shades. But Hello Sailor is my clear favorite: I’m on my third lipstick. I think I read about Tangee lipstick before but I’ve never seen it and, I think, for now Lipstick Queen covers all of my “your lips but better” needs. and happy whatever you celebrate (Easter, Passover, Spring, etc), Undina!!!! Thank you, Lavender. Happy holidays to you too. Nobody can be too old for a nice lipstick: my Grandma stopped using lipsticks in her 90s – only because she couldn’t see any longer (I still kept buying her colorless moisturizing ones). I think it is more a case of I am lazy-LOL! Popping in to say Happy Easter, Undina! What a cute and clever concept! I’m all for quirkiness in make-up and skincare. I love all things fairy-tale and read the Grimm stories a year ago or so. I enjoy how, like in mythology, there are so many versions of the tales in folklore. While I was thinking about this post I went through several versions of each story. Ok, you made me do 2 things with this post: 1) check out Ulta (didn’t buy but I am eyeing that Frog Prince blush) and 2) pull out my MAC x The Simpson’s tie in Nacho Cheese Explosion Lip Gloss – it stays yellow goldish…all I can say is it’s a LOOK but not a look I would wear to the office. Nice post and that Rusty is adorable! I had to look up what that Simpsons lip gloss was – probably not something I’d wear but yes, it’s a similar idea. 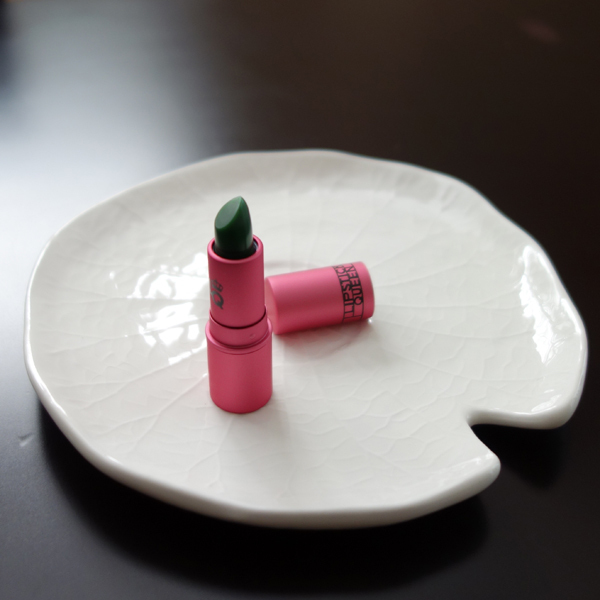 I have been wanting to try this little green item, but I was always wary of ending up with green lips, too. Sounds like a lot of fun. I’ll try a mini sometime soon. Love the lily pad dish. great touch! Oh, thank you! Sometimes you take care of those small details, like the idea – but never sure if anybody but you actually noticed. I’m pleased you did.